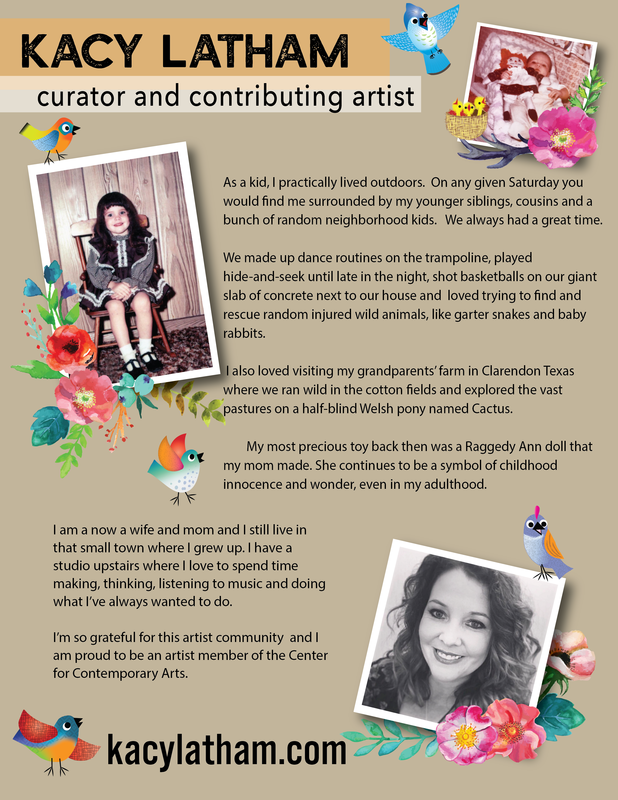 A life-long creativity junkie, I grew up in a very small town in Texas where I currently reside with my husband, two young sons and a pair of cats. Growing up, unfortunately, my small town had very few creative outlets for kids like me. I did get to take piano lessons, dance classes as a toddler and participated many extracurricular activities such as choir, band, and 4-H. Although I was always busy with something, there was no place to nurture my desire to paint and draw. Visual arts were not offered in any level of school at all. Nevertheless, like so many people in this situation, I learned self-teach with only curiosity as my guide. I remember having knack for drawing from early on. My classmates would beg me to draw My Little Ponies and their names in colorful bubble letters on their binder covers. I occasionally participated in poster contests and excelled at any slightly creative endeavor I could get my hands on. Most of my drawing skills came ... despite the objections of my teachers...from doodling in my notebooks during class. Fortunately, my mother was and still is the high school drama teacher. I grew up in a house where theatre and all forms of art were highly esteemed. Because of her influence, I felt encouraged to be creative in any field I could find. Nevertheless, I flourished in the high school theatre department and naturally looked for scholarships in theatre upon graduation. Eventually, I was lucky to attend Midwestern State University on an acting scholarship. The MSU theatre department was housed in the same building as the visual arts department. Although I loved my program, I would often walk through the halls and peek into the studios to see students painting, drawing, building and sculpting. I longed to be there as well. I craved to create fine art yet felt completely unequipped to even toy with the idea of a double major, even though my scene design professor, Don Henschel, pressed me to consider it. The best about being a theatre major is that if forces you to learn about a wide variety of arts by a way of a perfect cross section. We studied aspects of literature, music, art history, language, psychology, acting, drafting, design, painting, building, textiles, make-up, and lighting among many others. The diverse and enormous creative toolbox that I gained in my college career, still influences me to this day. Throughout my journey as an adult, I have had the privilege to do many creative things. From being an acting teacher, to having a 15 year career as a freelance graphic designer to having a short career as a clay sculptor, I refuse to box myself in to only one genre or method. However, finally returning to my childhood love passion, deciding to become a painter, feels like coming home. I'm a full-time artist, wife and mom and studio is upstairs in my home where I enjoy painting almost everyday. My desire is to be honest and unpretentious. I believe in bravery, courage, being honest in who you are. For info on any images on this site, please contact me via email, or my facebook page.